Columns Are Finished Well Sort of! The weather in NJ is still humid and cloudy and today heavy rain is expected. Is it just me or has the weather been a pain from the winter through now. We get a few nice days and then rain and cool, Twilight Zone, LOL. Thing are really moving with the house and it so quickly. More posts will be coming with snippets of things. I can’t show everything that is happening with full views. I need to keep everyone guessing and waiting to see when it is all decorated. So many ideas and plans are going through my mind now. The brain is in overdrive, LOL. I have a love of columns and old windows and I have no idea where that love came from. I am always attracted to them for some reason. 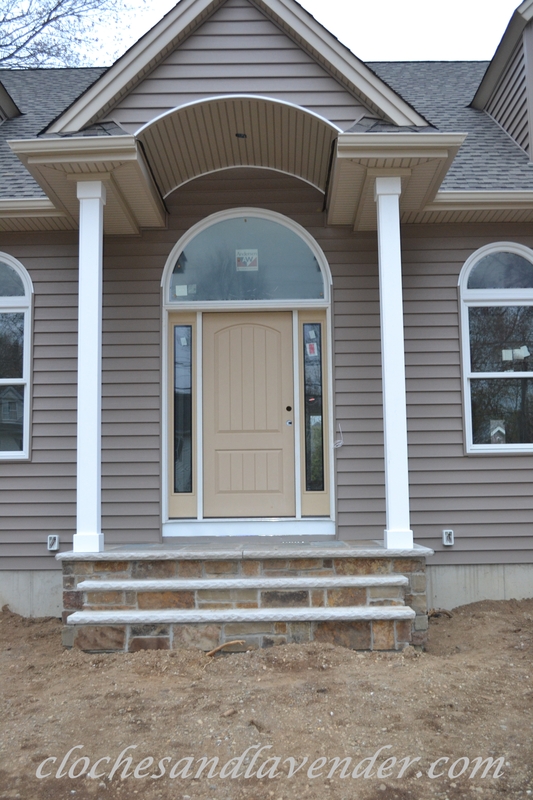 I knew columns would be on the front of house and was extremely excited about the end result. I assumed they would be round like our old home and have a bit of elegance to them. Well, they turned out to be square and that didn’t make me happy and I have to admit I did freak a bit. Then of course, sanity took hole and some help from John and I figured out how I wanted to embellish them a bit. Lowes to the rescue, I ordered these capital embellishments to add to the top. They have detailing that I love without going overboard. I decided to get this molding to add to the bottoms to give them a bit more detail. I can’t wit to see them added on, I think they will be the perfect finishing touch. More to come and it is pretty!!! Gorgeous columns! The embellishments are beautiful! Columns don’t go with my house design at all, but I sure do love them. How exciting to be at this stage in the house building. Looks marvelous Cynthia! Things are really coming along. So much excitement. Yes Donna things are really moving along, so HAPPY!!! That embellishment looks like a good solution, Cynthia! I haven’t seen those before, but, then again, I’ve never had columns myself, so they could have been around forever! : ) Looking forward to seeing how they dress up the columns. Kathy t hanks so much and I can’t wait to see the difference the y make when added. Thanks so much Susan. Loving having your input. Thanks Jessica, hope things are well. How pretty they will be1 I can see a couple of tall evergreens flanking either side of the porch to draw your eye up to the top of the columns so that you can take in the beauty of the detailing. Love it! That is a thought but my favorite is boxwood and we are thinking of having them all along the front. I think the detail is a great addition too. Can’t wait to see them added. I love columns too, and they’re a huge favorite of my hubby’s. He’s always dreamed of having a home with them. always to seeing your progress :). Have know idea but I will look into it for sure. No one else has told me that so I will check. Cynthia, I love the additional ornamentation you found for your columns! 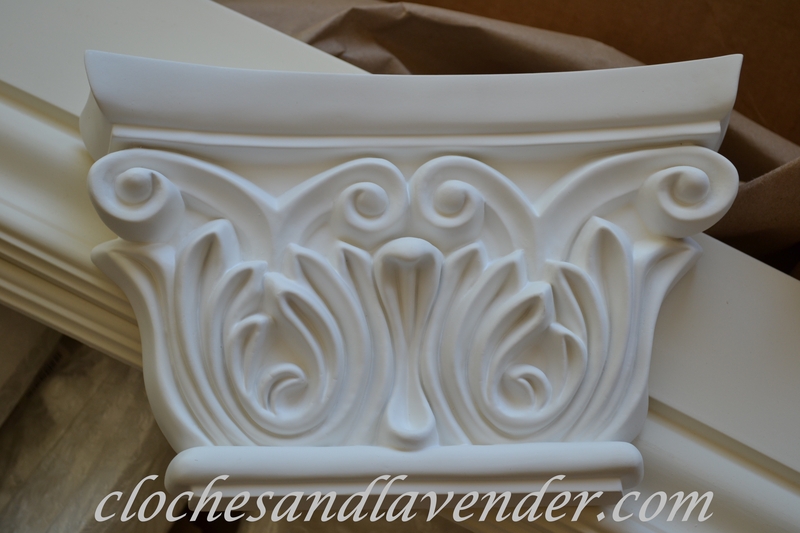 The details will give the columns such elegance! Thanks so much Betsy, that is what I thought. Things are really moving now!!! I know how disappointing it can be when expectations are so different than the result. But I must say, you came up with a terrific solution! Phew!! Thanks Mary Alice and the best part is the fix didn’t cost much. I can’t wait to see them finished. Hi Poppy thanks so much for stopping by. I can’t wait to see them put on there, I think it will make a huge difference. You came up with the perfect solution to embellishing your columns!…they are beautiful!…hope your weather cooperates with you!! Thanks so much Shirley, things are progressing quickly. Oh so pretty! I like how you’re planning on embellishing them. I like the square columns! The square columns have grown on me and I think they match our house. I think I w ill love t hem the embellishments place on them. Thanks for always stopping by, Kelly. Thanks so much Martha for still hanging in there with me and the long time lacking in projects. Believe me I am going through withdrawals, LOL!!! Cynthia, everything is coming together so nicely. I love, love, love the embellishments from Lowe’s that you found. The columns are going to look wonderful. I can’t wait to see them in place!!! Thanks Kitty.